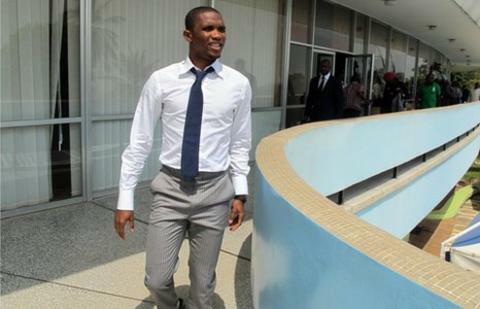 The Cameroon football federation's (Fecafoot) executive committee has reduced Samuel Eto'o's 15-match ban to eight months. The decision was taken late on Friday night following a lengthy meeting. The former African Footballer of the Year will now miss just four competitive matches before August. However they are the opening games in Cameroon's qualifying campaigns for the 2013 Africa Cup of Nations and 2014 World Cup. Cameroon football federation executive committee member Christopher Kaba, is happy that Samuel Eto'o's ban has been reduced from 15 matches to eight months. Cameroon president Paul Biya had asked officials to reconsider the controversial sanction. Eto'o was given the sanction after leading a strike by players of the national team in a row over late payment of appearance fees. The Cameroon team refused to play a friendly in Algeria in November because they had not been paid promised bonuses. The teams played two friendlies in three days in Morocco but then refused to travel to Algeria in protest at not receiving the funds. Eto'o himself did not challenge the ban, which would have ruled him out of the whole of qualifying for the 2013 Africa Cup of Nations and a large part of the preliminary campaign for the World Cup in Brazil in 2014. The striker's punishment had been widely condemned in Cameroon, where the former Barcelona and Inter Milan striker enjoys widespread popularity because of his performances at both club level and with the Indomitable Lions. Cameroon's federation has since agreed to pay $500,000 to the Algerian federation in damages after the game, for which more than 40,000 tickets were sold, had to be called off. Vice captain Enoh Eyong also had his ban reduced and he will miss just one game when Cameroon begin their bid to qualify for the 2013 African Nations Cup finals in February. A $2,000 fine on Tottenham Hotspur defender Benoit Assou-Ekotto for failing to show up for the two matches in Morocco was rescinded. Meanwhile, former Cameroon captain Rigobert Song has been appointed as the team manager of the Indomitable Lions.